Tiffany Edgar is the founder and facilitator of The Humanity Approach. As a transformational professional development strategist, she partners with CEOs and leadership teams to change the landscape within which they cultivate their leaders. She creates the opportunity to transform a corporation into a community and offers training, coaching and consulting with businesses small, medium and Fortune 500 companies. Tiffany was thinking about rebranding and building a new website with a new face, a new voice. She was referred to Blue Zenith through one of our power partners who knew that we would be able to discover and interpret her new brand voice. 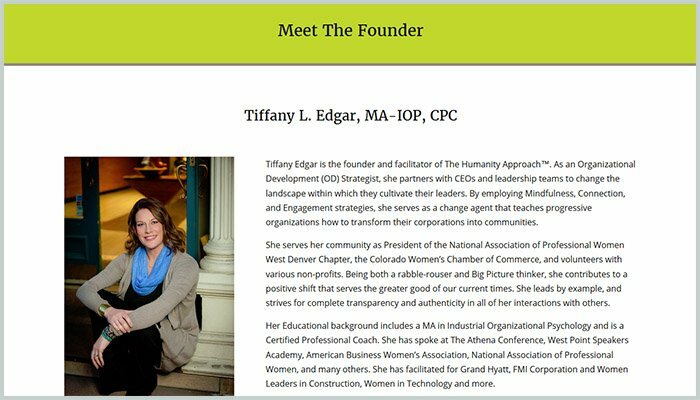 The new website spotlights Tiffany and the need for businesses to help guide their leaders to reach their full potential. She is able to promote upcoming events and media tours. She also offers a Mindfulness workbook and Webinars that are available through the site.